Show your students the significance of Native American history with Thinkport's educational media lessons and activities. Inquiry kits are a great way to help students learn about history. In this interactive, students examine questions and topics surrounding Native American history and review primary source documents from the Library of Congress. Help students understand how point of view is conveyed with Thinkport's social studies-themed literacy lesson. Students examine two speeches concerning the U.S. government's policy regarding American Indians in the 1800s to identify aspects of a text. Making strides in Maryland. The results are in and these incredible educators have been named as Maryland Teacher of the Year Finalists! See who is on the list, and let’s wish them all good luck! MPT will air the Maryland Teacher of the Year Gala on November 9, 2017. MPT’s education team will host an exhibit table at the Baltimore Book festival on September 23. 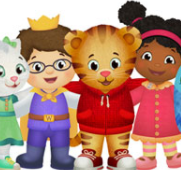 Stop by and come say hi to PBS KIDS character Daniel Tiger! Can’t wait to see you there. Using Frontline’s new 360 video "Why is Greenland Melting?" as a guide, this virtual professional development session will give educators resources and information to teach climate change confidently in the classroom.